The Peony Suite at Camai Bed and Breakfast continues to have its remodeling work done. The bathroom wallpaper has been stripped and the room painted. 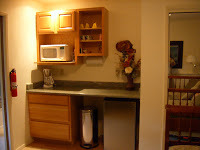 The granite counter top is installed and the new vessel sink is in place. The plumber comes early next week to hook up the sink and its new faucet. The Corian tub surround will have some minor repair work done to it next week as well. After these tasks are done we will install a new shower curtain rod that is U-shaped. This style increases the space inside the bathtub/shower. 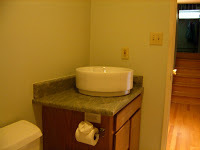 The pictures show the work-in-progress in the Peony Suite’s bathroom and the counter top in the sitting room of the suite. This is taking patience, but I know the end will be well worth the wait.